The Phoenix Innovation’s primary goal is to help grass-roots events in the Phoenix area, and the past year has been a great one. In 2012, LaidOff Camp Chandler taught people how to leverage social tools to stay competitive in their jobs and lay a solid foundation to help them strike out on their own. 2012 also saw the very first Ignite Food, a labor of love that covered all aspects of food culture from eating healthy to the love of bacon (naturally) and spirits. It also saw the third installment of Ignite Phoenix’s naughty sister event Ignite Phoenix After Hours, which returned to wow, shock and give you a glimpse into the saucier side of life. We could tell you more but you really need to see it for yourself. 2012 also brought about two main Ignite Phoenix events, while 2013 has seen Ignite Phoenix #14 sell out yet again. If your career touches the real estate industry in a way REBarCamp is the place to be. Hosting fantastic events both in 2012 and again just this past May, attendees learned from others how they are leveraging the latest tools, what trends are on the horizon and share your own experiences. The Valley’s own PodCamp AZ got a serious make over last year, evolving into TechPhx. TechPhx is an un-conference focusing on everything you need to know about new media and social media, from technology to tips and tricks. Check them out this coming November! On the tastier side of things, Cupcake LoveIn delivered the goods with a delicious charity event, 100’s of scrumptious and inventive creations made by some of the best bakers in town. And there is much more on the horizon for 2013. We have several events we’re already supporting, and are working to bring a few new ones on board. We are implementing a new calendar on our site to help people discover new events, and are working to build a list of resources to help grass-roots events kick off. There’s great stuff happening in Phoenix, and we’re proud to be a part of it. Stay connected to our blog (or subscribe to our newsletter) for more information. 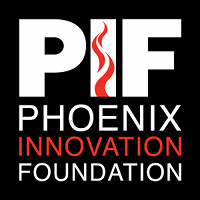 We are proud to announce the launch of the Phoenix Innovation Foundation (PIF)! Our mission is to educate and foster the local Phoenix community through community-based art, science, and technology events. There is an incredible number of great, free conferences, un-conferences, events, meetups, and groups across the Phoenix Metro Area, who all share some common challenges. PIF seeks to bring these groups together to leverage financial, legal, and logistical support. We are an Arizona non-profit, and are seeking Federal 501(c)(3) chartiable status. We are just getting the ball rolling, but are thrilled to already be working with three big Valley events: PodcampAZ, IgnitePhoenix, and Geek Week AZ. Subscribe to this blog for updates, or you can email us at innovatephoenix at gmail.